How about moon dust on your wrist? Yes, its possible if your sport Romain Jerome’s Moon Dust-DNA Black Mood white. 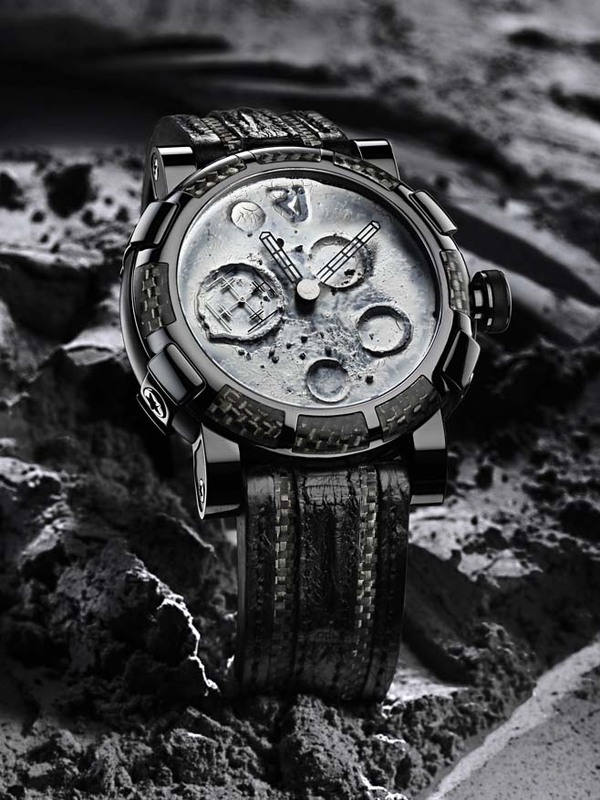 Romain Jerome watchmakers have adopted a revolutionary procedure from the world of art, by applying a mineral coating comprising authentic Moon Dust combined with natural pigments. Jean-François Mojon, OPUS X watch engineer has been awarded the prize for Best Watchmaker of the Year at the 2010 Grand Prix d’Horlogerie, Genèva. Jean-François started his collaboration with Harry Winston’s Timepiece team in 2006 with the Lady Z then worked on the development of an exclusive movement for Project z6. In 2008, he came with a brilliant idea that would give birth to the OPUS X, unveiled last year at Baselworld international fair. With the OPUS X, time comes in a new shape, through the clever architecture of the case and the time display; and an unusual movement effect, achieved through the 24-hour rotation of a platform supporting the time displays. The hours, minutes and seconds display is broken down into three modules which maintain the same orientation regardless of the platform’s position. The revolving effect is accentuated even more by the fact that the oblique axes of the displays conform perfectly to the curve of the crystal. The manually-wound mechanical movement, completely new and original, was developed on a planetary gear train consisting of a sun gear, a planet gear and a frame. In addition to the hours, minutes and seconds, it displays a second 24-hour time zone around the edge of the platform and a linear power reserve on the back of the case. You are currently browsing the watchalive weblog archives for December 2010.